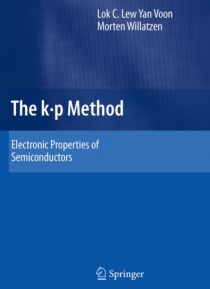 I ?rst heard of k*p in a course on semiconductor physics taught by my thesis adviser William Paul at Harvard in the fall of 1956. He presented the k*p Hamiltonian as a semiempirical theoretical tool which had become rather useful for the interpre- tion of the cyclotron resonance experiments, as reported by Dresselhaus, Kip and Kittel. This perturbation technique had already been succinctly discuss… ed by Sho- ley in a now almost forgotten 1950 Physical Review publication. In 1958 Harvey Brooks, who had returned to Harvard as Dean of the Division of Engineering and Applied Physics in which I was enrolled, gave a lecture on the capabilities of the k*p technique to predict and ?t non-parabolicities of band extrema in semiconductors. He had just visited the General Electric Labs in Schenectady and had discussed with Evan Kane the latter's recent work on the non-parabolicity of band extrema in semiconductors, in particular InSb. I was very impressed by Dean Brooks's talk as an application of quantum mechanics to current real world problems. During my thesis work I had performed a number of optical measurements which were asking for theoretical interpretation, among them the dependence of effective masses of semiconductors on temperature and carrier concentration. Although my theoretical ability was rather limited, with the help of Paul and Brooks I was able to realize the capabilities of the k*p method for interpreting my data in a simple way.